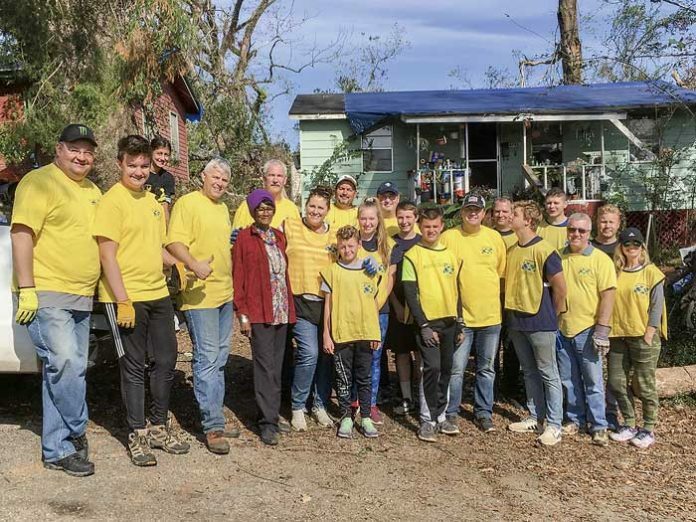 Nearly 200 members of The Church of Jesus Christ of Latter-day Saints from Fayette and Coweta Counties traveled to Marianna, Florida this weekend to aid hurricane victims in the aftermath of Hurricane Michael. This latest trip is part of an ongoing effort by local Latter-day Saints to help communities devastated by hurricanes in Florida and the Carolinas. For three days, they cut and removed trees, cleared debris and installed roof tarps. The volunteers camped out in their own tents around a local church building, where they organized into work crews. Volunteers were responsible for their own travel, food and shelter so that they would not take away from limited resources in impacted areas. Photo/Submitted.